The Mongolian parliament has chosen the former mayor of Ulan Bator, Miyeegombo Enkhbold, as the new prime minister. Mr Enkhbold was the widely expected choice, being the Mongolian People's Revolutionary Party (MPRP) candidate. Mongolia was plunged into crisis two weeks ago when the MPRP withdrew from the governing coalition, causing Prime Minister Tsakhia Elbegdorj to resign. 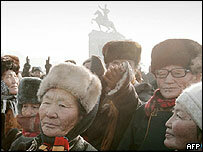 The rebels said they were protesting against Mr Elbegdorj's policies, which they claimed were damaging the economy. But members of Mr Elbegdorj's Democrat party accused the MPRP of toppling the administration because they wanted to stop the drive against corruption. The political crisis has sparked days of public protests, with supporters of both sides braving sub-zero temperatures to come out on the streets and make their voices heard. Mr Enkhbold, the chairman of the Mongolian People's Revolutionary Party, was given official approval by President Nambaryn Enkhbayar on Tuesday, as well as the majority of the parliament. His approval was expected as the MPRP was confident of securing a majority vote with the support of minority parties. Mr Enkhbold, 41, will now begin appointing his cabinet and setting up the new government.